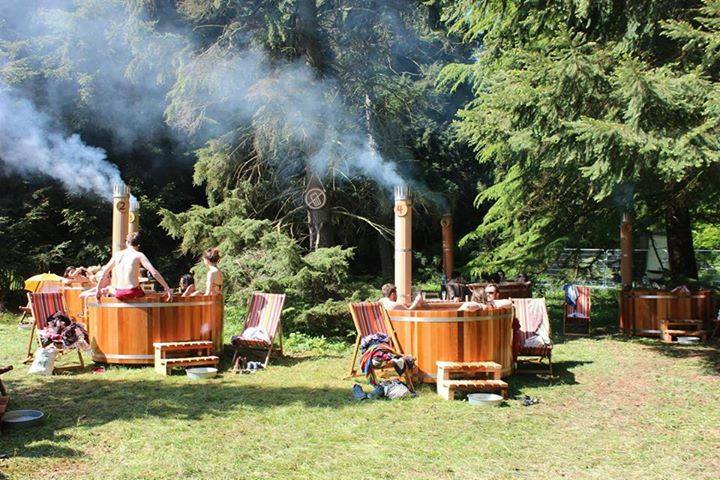 Bathing Under the Sky takes spa experiences to another level… how amazing are their luxurious outdoor wood fired bath tubs? Come on! The idea of having an outdoor spa within a festival is genius. I mean, when showers are scarce, when sleeping in a tent and partying hard has taken the energy from your battered body, what best to relax and recharge for a couple of hours? The spa was placed in a semi-private area of the festival, so while festival goers relaxing in a specific area could see you, we were pretty sheltered from the main event. Upon arrival, you get a wristband with your time slot and a rubber band for your complimentary glass of prosecco (yum). Make sure you wash your feet and then just join in! Not long after you sit, you glass of bubbly is whizzed over to you and you can get more by the glass or a bottle. The water is kept at around 40 degrees and is super pleasant. We were quite lucky it wasn’t raining, but they do have umbrellas available. It is lovely just to be in contact with nature, with some luxury but without harming the environment. Overall, it was a very relaxing experience. There is always water available to keep you well hydrated. You can alternate your time between the western red cedar and stainless steel tubs and the UK only barrel sauna (the most adorable thing, ever). Bear in mind you will have a hot shower before and could have one after your experience (within the 2-hour time slot) – this is worth gold to festival goers, I am sure! Bathing Under the Sky caters for group events or you can just rent a tub for your garden party or your own leisure, for example. They even have a double-decker hot tub bus. No, I am not joking. How fabulous is that? You can get visit the Bathing Under the Sky website for all information on the festivals they will be attending this year (you can book your slot online), as well as info on hires for all you needs. You can also give them a ring on 0176326855 or 07828978811 and talk to the lovely Alexandra. They are also on Facebook – so follow them there for updated info on where they will be! The next festival is Isle of Wight, but if you are not going there, don’t worry, they are doing plenty this year! In this occasion, it cost £30 per person, but check prices for other events, which can be booked in advance. Wishing I was back in here! Thanks again @bathingunderthesky for having me yesterday!